There are plenty of opportunities for adults to help out in our children and youth programs! 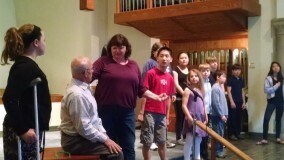 Children’s Chapel is taught on a rotating basis by teams of parishioners and clergy. A story is provided, and someone is always available in the church school office to lend a hand if needed! If you want to help in Children’s Chapel but aren’t sure about leading, consider helping as an assistant until you get into the swing of things. Each week, an adult volunteer helps out in the church school office, providing additional support as needed. Our Confirmation class incorporates adult mentors as spiritual role models and a connection to the larger parish for the students. Our Youth Group includes adult leaders who assist Mother Christa, help with transportation, and have fun with us! As per diocesan policy, all adult volunteers complete a simple online course (“Safe Church”) to ensure the safety of all our children. Certification is good for five years. Contact Kathleen at office@stthomasrochester.org to register for this program. If you can help out in any of these ways, contact Mother Christa at christa@stthomasrochester.org.